If you’re a digital artist, you’re going to need a laptop that can keep up with your creativity. Among other considerations, that means a machine with a high enough technical spec to handle Photoshop, Maya, or whichever program is your favorite, and a design that is portable enough to take you from meeting, to office, to train, to coffee shop. Whether you’re looking to take your first steps into the world of digital art, or you want to upgrade your workstation, there’s a product out there that’s perfect for you and your requirements. For a graphic design laptop check out the article. Screen – you’re going to need a display that allows you to see every last detail in your work, so don’t settle for anything less than 1080p (most laptops have this as standard now, anyway). Consider also whether you’d utilize a touchscreen: some creatives love them as they make gestures much easier, but remember that they will drain your battery much quicker than standard screens. Pen – hybrid laptops are a popular choice amongst designer that like to draw and navigate with a stylus, and if you’re one of the many hybrid-fans, think about the comfort and precision of the pen that comes with your chosen machine. Processor – most design software needs a lot of power behind it to function smoothly, so you’re going to need a laptop that packs a punch. Intel Core i7 and Xeon are both strong options, and will support even the most complex projects, but if your software usage is more modest go for something cheaper and less battery-draining like a Core i5. Memory (RAM) – The more RAM you have, the more space there is for the temporary files that are created while you work. By having plenty of RAM at your disposal, your laptop will keep up with you when you’re performing complex tasks. 16 GB of RAM is the minimum you should be looking at in a laptop that will need to manage design projects, but if you can afford it (and if you plan to work with 3D or video), go for 32 GB. Graphics – you’re going to need plenty of GPU power, and even if you only work in 2D your layers and effects will still need it. We like NVIDIA’s Quadro and AMD’s Radeon Pro, which will both allow your software to do its thing. Storage - of course, you can buy an external hard drive, but that’s just one more piece of kit to carry around, and they’ll slow down your software and your access. SSD hard drives are the ideal choice for digital artists, so seek them out for them when shopping around. The price will go up the more storage you have on board, so if you can live with 512 GB rather than 1 TB, stick to that. Connectivity – digital artists can’t really afford to settle for anything less than a couple of USB 3.0 ports, and you’ll most likely want Thunderbolt for connecting an external monitor. Ethernet is useful for speedy networking, an SD card slot is handy if you use photography in your artwork, and HDMI will be necessary if you need to connect to projectors to make presentations. Battery - if you’re buying a laptop over a desktop, it’s likely that you’re planning to work on the road. With that in mind, you might not always have access to mains power so you’ll want to make sure your chosen device has plenty of staying power. Eight hours is ideal, but it really depends on how you’re going to use it to say how important a long battery life is. The best all-rounder on the market is the Microsoft Surface Book 2, for its ability to pack everything a digital artist needs into a small and perfectly formed body. Microsoft’s Surface Books have been at the forefront of the hybrid market for a while now, and their relatively new ‘2’ version has raised the bar once again. Offering all of the power needed to bring your artwork to life in a gloriously flexible body, this laptop will keep up with you wherever you’re working. The flip-able touchscreen is great for drawing on, and the Surface Pen is comfortable enough to use for long creative sessions. 16 GB of RAM is plenty of memory to ensure smooth loading and multitasking, so you shouldn’t experience any lag even when you’re working flat out. The price is relatively high for the spec, even at the lowest model, but it’s a fantastic investment that will up your productivity and help you get the most out of your art. 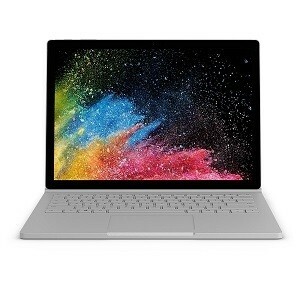 If you’re looking for something cheaper, the original Surface Book has a smaller 13.5” display but also a much smaller price tag. If you’re a professional artist looking to upgrade, the best professional option is the Apple MacBook Pro with Touch Bar. The saying goes that you get what you pay for, and with Apple’s top spec machines that’s definitely the case. The Touch Bar is a new addition for Apple, and replaces the function keys found on most laptops with something much more intuitive. It will automatically display the tools you need for the program you’re using, making light work of scrolling through options and controls. The Retina screen is stunning and will really allow your artwork to shine, and Thunderbolt connectivity will keep up with you nicely. The price tag is the only real downside of MacBook, and depending on your output you might need more than the 512 GB storage, but other than that it’s pretty much perfect for professionals. If you’re PC over Mac, Dell’s Precision 5520 is a superb option. It’s pricey, but as well as being the thinnest and lightest 15” workstation in the world at the time of writing, it’s also got all the tech that you’ll need to run the most demanding of software. If you create digital paintings you’re going to need a laptop with a screen and a stylus sharp enough to offer you the ultimate precision, and because of these features the Microsoft Surface Pro is the best laptop for drawing. This is the second list-topper from Microsoft, but it’s well deserved. This ultra-light, flexible and portable hybrid packs more power into its tiny body than you’d think possible. The Intel Iris graphics card will support the software you’ll likely be using to draw with, and 16 GB of RAM and 1 TB of storage is frankly impressive for such a small machine. There’s only one USB port which could be a pain, but that’s the sacrifice you make in favour of such a compact body. The screen is 10 point multi-touch, giving you plenty of control when you’re working directly on it. It’s smaller than the other screens on our list, but when it’s so perfectly formed you can afford to lose an inch or two. Another awesome hybrid option is the Lenovo Yoga 920. A 14” multi-touch screen and Active Pen 2 with 4,096 levels of sensitivity ensures that your lines and shading are as accurate as if you were drawing with a regular pencil. As we mentioned up top, portability is super important for most creatives, and the HP ZBook Studio G4 DreamColor is a lightweight beast of a machine. Although most of the machines on our list are perfectly portable, we love that you still get 32 GB RAM and an NVIDIA Quadro chip to drive this lightweight laptop. For such a small product, you’re getting all the power of a full-size desktop which can't be valued enough by digital artists. The anti-glare screen is ideal if you’re working in varied conditions, as direct sunlight won’t affect your view. The HDMI port takes you from office to boardroom, and is perfect for presenting your creations to clients. The battery life is the only let down on this laptop, and for a portable machine that might be a deal breaker for some. But, HP’s Fast Charge technology will bring the battery back up to 50% from empty in just 30 minutes, which is its saving grace. Dell XPS 9560 is another fantastic option if portability is important, but you’ll need to spend a fair bit if you want the top spec model. If you love the options on our list but don’t want to spend quite as much, you can’t go wrong with Apple’s MacBook: our best affordable option. As we’ve already mentioned, Apple tech doesn’t come cheap, but this is a great option if you want to stick with Mac but spend slightly less. With a ten hour battery life it’s great for on the go, which is excellent news for students wanting a laptop to take out and about with them. It’s also tiny, making it all the more portable. The Retina display technology might be a couple of years old now, but it’s still sublimely sharp and is great for editing images. There’s only one port on board, so expansion isn’t much of an option, and the smaller screen might bother some people, but for a decent price you’re getting a lot of great technology that’s perfect for getting started in the world of digital art. If you want to go cheaper and need a 15” display, the Acer Aspire E still packs a punch with its NVIDIA GeForce graphics and 16 GB RAM, but will cost you significantly less than a Mac. If you’ve got the budget for it, Microsoft’s Surface Book 2 is the best all-round option for digital artists needing a portable workstation. Combining a hybrid touchscreen design with a spec that would still be impressive on a full-size desktop, Microsoft have shown once again that they’re the masters of balance. 16 GB RAM might be a struggle if you’re working in 3D or with video, and it’s definitely on the pricey side, but if you’re drawing, working with graphic design or editing photography, this stunning little machine will see you through all of your creative projects.